Penne is one of the most popular varieties of pasta in the world and pesto one it’s most popular accompaniments. Penne, because of its practical shape and size makes it easy for use in a variety of meals. Pesto, the grounded sauce of basil, garlic, and pine nuts, originated in the Italian port city of Genoa. 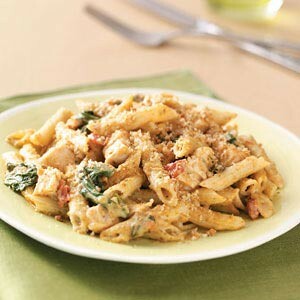 To prepare the Penne with Chicken and Pesto, you will need 1 package penne pasta, 2 tablespoons butter, 2 tablespoons olive oil, 4 skinless, boneless chicken breast cut into strips, 2 cloves garlic, minced, salt, pepper, 1 1/4 cups heavy cream, 1/4 cup pesto, and 3 tablespoons grated Parmesan cheese. In a large pot of lightly salted water, boil the penne pasta. You may add a few drops of olive oil to the water to prevent past a sticking together. Cook until firm to the bite. In a skillet heat the butter and olive oil over a medium flame and sauté the chicken and garlic until the chicken is almost cooked. Turn down the fire and add the salt, pepper, cream, and pesto as well as Parmesan cheese. Continue to cook until the chicken is no longer pink. Add the pasta.